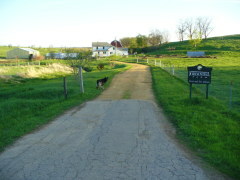 Jordanal Farms. This place has turned me into a bacon snob. No, “bacon snob” is not an oxymoron. If you have ever tasted Jordanal Farms’ nitrate-free, pasture-raised bacon, you know why. I now feel about other, inferior bacon how I feel about milk chocolate (versus dark)– it’s just not worth it. Give me the good stuff. I also like how their website has a meat chart. Tomato Mountain Farm. My husband and I used to call the man who worked at this farmer’s market stall “crazy tomato guy” because he is absolutely passionate about tomatoes. 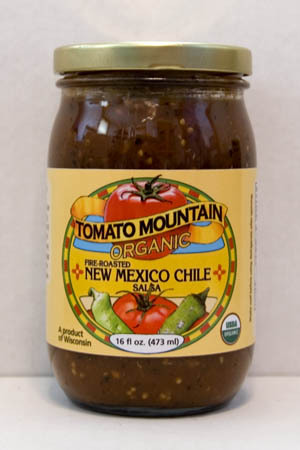 At the winter market, you can try the best of the summer crop by buying Tomato Mountain’s salsas, soups, and pasta sauce. My favorite is their Fire-Roasted Green Chile Sauce. And I’m dying to try their Bloody Mary Mix. Driftless Organics. 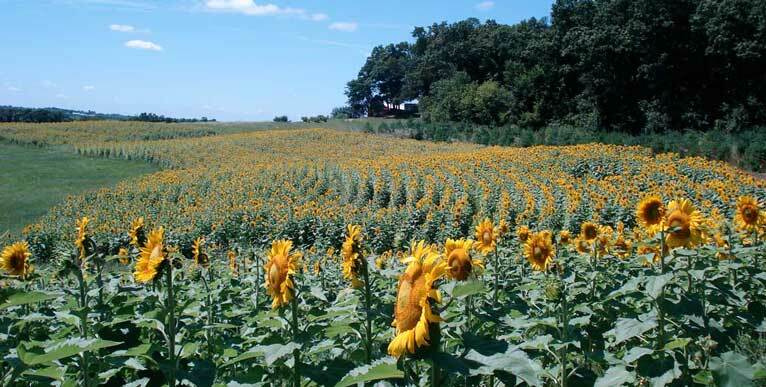 Driftless Organics posts on its website what items will be at the market each week, so you can plan ahead. Last Saturday, they had colorful squash, beets, potatoes, carrots, and several root vegetables I couldn’t identify. I bought several bottles of their Cold-Pressed Organic Sunflower Oil for myself and for gifts. It’s delicious for stir-frying and baking. My favorite way to enjoy it, though, is just to dip fresh bread into it. So, as you can see, the winter market isn’t all about celeriac and pickles. There’s a lot of good stuff out there, so don’t be afraid to give it a try. And here I thought I was a bacon snob, and never had anything like this! It is interesting when you experience the real thing versus what we buy mass produced at the grocery store. I just have to try that sunower oil! No wonder the birds like those sunflower seeds so much. My students practice their fine motor skills in fall. We put giant dried sunflowers in the sensory table. They have to pick the sunflower seeds out with a tweezers. Great fun! If only we had winter markets here in Philly! Our wonderful farmers markets closed up Thanksgiving week. Boo hoo. Totally agree with you on the bacon. We get ours from Whole Foods, and after eating it can never go back to the Oscar Mayer.